Parramatta Road is notorious as a problematic traffic artery. Commuters try to avoid it. Councils try to fix it. I simply aim to know it. I meet, interview and document the businesses that don’t fit into shopping malls, the sparse pedestrians, the thriving and vanishing industries across around 20 suburbs of western Sydney. After decades of government and media debate no body has come to consensus about how to improve Parramatta Road. Meanwhile, it quietly gets away with being more interesting than you would think. Even without big decisions being made about its future, the road changes each day: sign by sign, block by building, business by business. I go into the crevices to reveal something of the old and weary beast the way it is today, for future reference. Parramatta Road is an ongoing project. Backpackers are tattooed at House of Pain, Annandale. A couple celebrate their first wedding anniversary with family at Stanmore McDonald's post midnight. Late night football at Wash n' Wax, Concord. 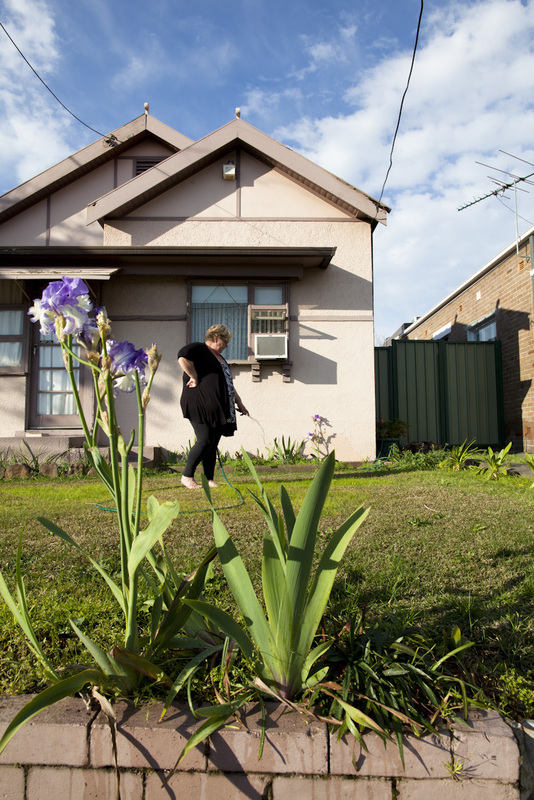 Lynette Palmer, resident of Parramatta road, Haberfield. Found watering her front garden. My mother in law lives across the road. These are businesses, those houses are businesses. I moved here in '75 from Victoria. Ian, my husband, has lived across the road nearly all his life. He was born over there. But there are hardly any houses now on Parramatta Road. I don't know if they'll start bringing more units in like they have in Burwood and Strathfield area. They are starting to build units with shops beneath. But there is nowhere for anyone to stop — that is the problem — stopping on Parramatta Road to go to a shop. That is why it is better off left as housing. It is very quiet. You don't have any problems with neighbours. We don't notice the traffic. I'd say the planes disrupt us more than the traffic does. If the traffic stops at night-time and it becomes really quiet, we wake up and think, “What’s going on?” There has been an accident somewhere. We all get up and see what's happening. We don't mind living here. We own it. There's no way you can buy a house in the inner city for what we bought this for. Years ago it wasn't that much but now we've been offered $800,000 for this. But my husband didn't want to take it because his mother is 90 and we didn't want to move away from her. I brought my two sons up here. One is still living at home and the other one lives two suburbs away. I don't think the kids will ever leave this area. They've been over to Bondi and they came back. They liked it but it wasn't as central to where their work is. Once my eldest son ended up in the middle lane, crawling. The cars all stopped for him. He was two. Australia's first Costco opens to great fanfare at Parramatta Road, Auburn. He started in ‘73 — that’s when this opened. There was a little house and the bloke who used to own the land had a wood working place in here making tables and chairs. My father had about 20 cars in two rows out the front. Fiona was introduced ‘92 or ‘93. Before that my father had a pet goat in the yard, Harry. Customers would look at cars and have this goat alongside them. We’ve had cockatoos, a dog. But after all that he decided a mannequin was a lot easier because he didn’t have to feed it or care for it. Just put it out the front. About ‘83 the paper did a thing on her 21st birthday. She doesn't help us sell cars. She just makes us little different. She often wears evening attire. I go to Vinnie’s once every month in Merrylands with $20. They know I am in there for the mannequin now and I buy a big bag for her. When she first came out her name was Ita after Ita Buttrose. But we had a complaint from a lady called Fiona so we changed her name. Fiona said the mannequin out the front was offensive. We’re not trying to offend anyone — we are just having fun. She was kidnapped once before my time and sent back in bits in the mail. A hand would arrive, then a leg. The ransom note was signed “Men against sexist pigs”. Another time during schoolies a bunch of kids turned up in a car and jumped out — I was on crutches at the time — they took her and drove off laughing. We just got a new one. We get them on ebay now and they arrive in the mail. Because of the grime and grit on Parramatta Road she gets knocked around. On a Friday night or afternoon the boys from the pub come across and pull her top down so we have to keep an eye on that because people do start complaining. I can understand why so we try keep an eye on her. Danny, R A Motors, Granville. Roughly about 26 years. Something like that. How do you describe your profession? We import material and we manufacture plastic. We import the sheets and raw material. And we sell it to sign writers, anyone who works from it. We build things: newstands, displays, signs, you name it. Plastic is like timber sheet: we build partitions, walls, ceilings. What do your main customers use your products for? My main customers are from big companies who require our products. Then you get also public people because anyone wanting something for their home. Perspex in the backyard. A door for this dog. A cubby house, windows. The roof for this backyard when you sit underneath – a pergola. That is only in the house. Anything you see plastic in a house we can do. Then when you go to companies have a look at these photos (we go through plastic swinging doors to another plastic room. The photos themselves are behind clear perspex). If you put colour underneath, in light, it will shine a different colour. Letters for signage. Arm chairs. Wall unit. This is a table and there is a light inside. So you can see a cross shadow going this way. Yes. Wall, ceiling, chairs, table. It is all we do. Fish aquarium. You put the whiskey in this (a bar table with wheels). This is for the beach because plastic is UV so when you sit underneath you don't get burned. You can still get tanned. But the plastics stop the UV. So you can sit all day and get the tan. This is a complete bathroom made of plastic. It was like a cabin at the beach. Plastic doesn't rot. It doesn't need paint. Easy to clean. This is before and after. It's like timber. You can do anything. Maurice, corner of Johnston Street and Parramatta Road, Annandale. I am nearly 69 years old. And more or less I see so many people, aggressive, unhappy, you know. So the only way to reach them is with a simple message. And that is what I do. The cheapest way to get a message across is to have a smile like this (points to smile on his sandwich board). Especially in the morning. I have quite a lot of signs. This one if you look: “Family the most important. Always forgiveness love and home. Happy family inner peace.” Simple messages like this are so important. Youth suicide is another of my campaigns. It is very high. How many kids are happy? Not many. Why? Because we give them everything. But we don't hug them, we don’t hold their hands. Especially now when a lot of people are working and they live too far away. They spend hours travelling to work and back and when they go home they get cranky, kick the dog and they get angry with their children. Communication is the most important. When your children don't talk to you or don't tell you off or swear at you … when it is silent you've got no chance. When you don't communicate it is finished. When you do things you have to them with a passion and if you make someone smile then you are on top. Clown School graduation night on Parramatta Road, Annandale. Debutantes and family on Parramatta Road, Leichhardt. Hey Hey Kebab, Parramatta Road, Auburn. The Laurels play the Annandale Hotel. What was the reaction when you moved in and started? And I am like, “Yeah guys can come too I guess. There is no reason why not but it's not the sort of thing most guys want to do.” He said, “Cool man I would like to try.” And I said, “Great there are a few gay guys in the class as well and you are cool with that? We usually put the guys together.” And they said, “Oh well don't worry about it mate.” It is a funny business. LYNDAL IRONS is a Sydney-based photographer and writer focused on local reportage. In 2013 she was chosen as one of the top four Australian photographers under 30 in the Qantas Spirit of Youth Awards (SOYA). Her series Parramatta Road was exhibited in 2011 at Global Gallery, Paddington, and also in Add On (2012) as part of the Head On Photo Festival. Images from the series have been selected as finalists in the 2011 and 2012 Sydney Life exhibitions in Hyde Park in Sydney, Australia, as part of the Art and About Festival. Her work is held in the collection of the State Library of New South Wales.